Bob's Turkey Farm raises "good looking Toms" for your Thanksgiving table. It’s Monday morning and the sun is beaming down on the snow-white backs of the large birds roaming outside Bob’s Turkey Farm in Lancaster, MA. At the sight of people approaching the wire mesh fence that secures them, they gather eagerly and utter their signature gobbling sound. The fields and sheds house about 10,000 birds and it’s almost their time to shine. Most of them will end up gracing Thanksgiving tables across the Commonwealth at the end of the month. The rest are destined to be Christmas turkeys. This is the busiest time of year for the family that runs the farm. Bob Van Hoof, a World War II Navy veteran, started the business in 1954, with just 125 turkeys. “A fellow went out of business that had a good breed, and we just used that same breed with the same blood line ever since,” he explains. Since he retired, two of his seven children, Susan Miner and Richard Van Hoof, work full-time to keep things running with occasional help from their siblings. “It’s truly a family business,” says Sue. 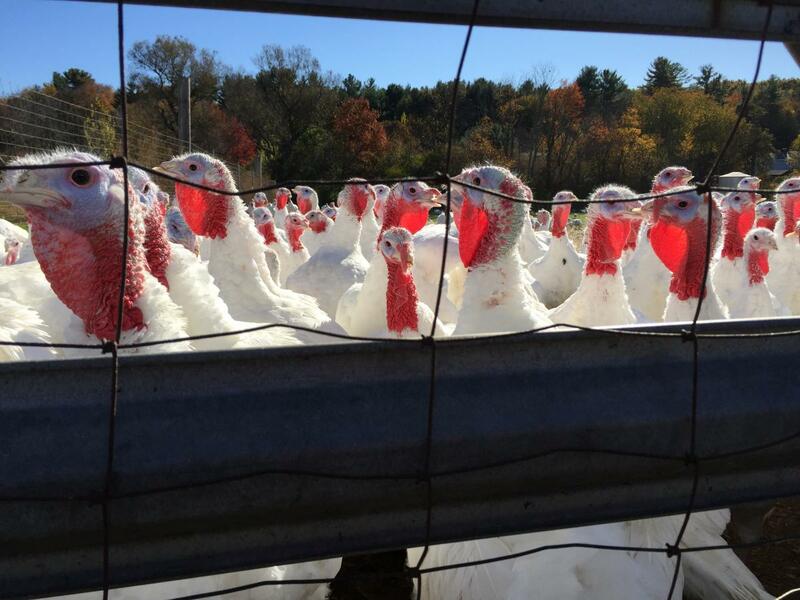 The team at Bob’s Turkey Farm will start slaughtering and processing the birds on Nov. 12 and work straight through Thanksgiving Day. “We grew up around it, so it doesn’t faze us,” says Sue. “All hands on deck.” Once the turkeys are cleaned, they’re packed in chill tanks with ice and kept at a very low temperature. According to Bob, Sue and Richard, the flavor and texture are better if the turkey has been dead at least two to three days. After processing is done (it takes over a week), the staff starts preparing specialty orders, deboning turkeys and making rolled roasts. Every year they sell at least 3000 quarts of homemade gravy to dress the meat. Things slow down at the farm in winter and pick back up in spring. When Richard picks a breeder, he looks for good clean uniform feathers, a long tail, a broader breast, straight legs and toes that aren’t crooked. “Good lookin’ Toms,” Bob chimes in. “We don’t have any problems with this particular breed.” The Broad Breasted White Turkey, the most widely sold domestic breed, can grow to over thirty pounds (although most customers prefer them smaller). 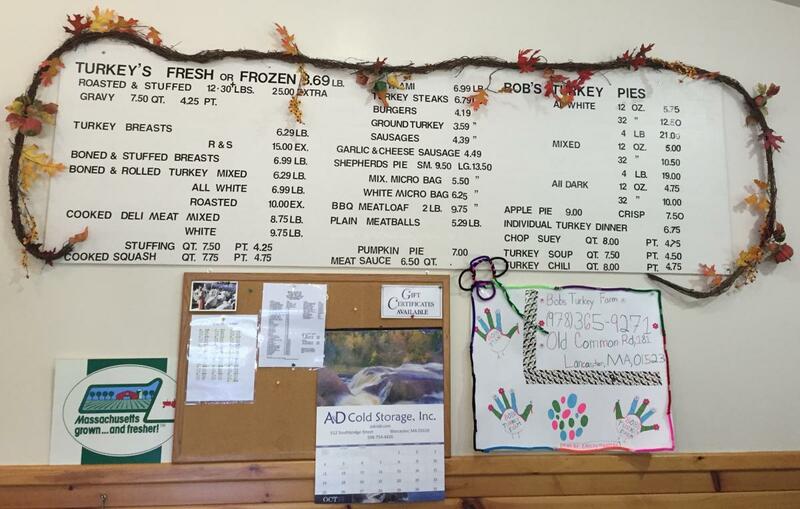 The on-site kitchen and store runs year-round, selling pot pies, soup, stuffing, ground meat, sausages and many other items. According to Sue, the individual frozen turkey dinners have been flying off the shelves. “It’s got mixed-meat turkey, stuffing, gravy, and then in separate compartments, it’s got mashed potatoes and butternut squash,” she explains. They also slice breast and thigh meat daily for sandwiches; in the summer, they sell a lot of turkey salad. If you haven’t ordered your holiday bird yet, it’s not too late to get one from Bob’s. They take orders up until the week of Thanksgiving, but they do run out of certain sizes as it gets closer to the big day. And if you should choose to buy your bird straight from the farm, make sure to grab dessert and some tasty side dishes—and take a family photo while you’re there.